Master Metal Engineering (MME) was established in 1974 in South Bend, Indiana. The company expanded to 35,000 square feet with the acquisition of South Bend Precision in 2009, with two separate facilities housing both manufacturing and administrative offices. Ownership of the business has remained the same since 1996. Click the links below to view the equipment specifications in each of our departments. Note: E-25 series Swiss machines are 6 Axis, Backworking, Double Spindle with Axis positional transfer between Spindles, Milling Heads, and Drilling Heads. The M-32 is 9 axis with specifications similar to the E-25J but with a larger copacity. 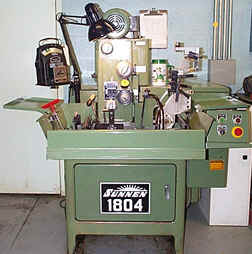 Brown & Sharpe Cycle Size CNC Surface Grinder 6" X 18"
Mitutoyo FN905 Travels: X - 34.0" Y - 22.0" Z - 15.0"
A large attended gauge crib including thread gauges, gauge blocks, hand measuring tools such as bore and Sunnen gauges, and most other standard measuring equipment calibrated to the requirements of ISO-10012. Actual inspection department manual equipment is available if needed. Fellows 4A Versashaper 3.0" 8.0" 6.0"
Fellows 4A Shaper 3.0" 6.0" 6.0"
Maximum Workpiece Size 39.25" X 21.75" X 8.75"
Machine Travel 13.75" X 8.75"
Hyd Mech H-12 CNC Saw, 13" X 12" with 48" Stroke; DoAll C5A Horizontal Cutoff Saw, 9" diameter max. Assembly department is used for electrical/magnetic clutch devices, electrical and pneumatic surgical device drivers, surgical hand devices, and gear drives at this time. From simple press fits to complex geartrains, we can handle your assembly needs.